I am asked often about resistive vs overspeed training and what gets better results. When you speed train which type of training do you use? If you want fastest path to get results, resistive speed training gets it done. You see, overspeed training pulls you faster than you can run, which quite often pulls you out of your proper mechanics. When trying to get faster your running mechanics are the foundation for success. Poor mechanics while training will translate into poor mechanics on the field. Quite often athletes that are being pulled in a overpeed towing drill force their muscles to brake because they are being pulled out of control which is counterproductive to the goal of the exercise. If you are going to do overpeed training I suggest running on a slight decline or running with a wind at your back. Resisted training allows you to improve forward body lean, and increase power through a triple extension of the hip, knee and ankle joints. The force created during this type of training while maintaining proper running mechanics will make you faster. Be certain not to overload the resistance to a point where form and mechanics are compromised, ususally 7 to 10% of the atheltes bodyweight should be used as the amount of resistance applied. Ultimately first step power, acceleration and speed will be increased by using a resited device such as a Speed Sled of Speed Resistor. The summer is ticking away! What are you doing to make yourself better this summer? If you are looking for an edge on the competition check out Training for the NFL program, it gives you the specific training routines I use down here with my athletes preparing for NFL and college training camps. It even includes my position specific conditioning protocols. Where can you get a 4 phase training program that gets incredible results for such a great price? 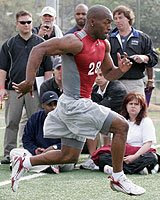 Many of my athletes have been running blistering times in the 40 yard dash at their college testing day. Highlights include Damian Copeland a true freshman at Louisville who clocked a 4.37 sec. 40 and Youngstown State true sophmore LB Deonta Tate who ran a 4.53 sec. 40 yard dash. Both athletes said teamates were asking them about their unique breathing technique they used when running the 40. This breathing technique in my opinon is key for running a fast 40 yard dash. Learn this specific breathing technique which is detailed on my Combine Freak DVD. PS. Don't forget to get your Speed Tools Speed Resistor today to start getting faster! I am often asked and e-mailed by athletes, parents and coaches what they can do to run faster. It seems like everyone is is feeling the need for speed these days. Whom can blame them, it what separates the pros from the joes! Work on Your Arm Mechanics - Too many athletes have poor running technique. If you are not efficient, you are wasting energy and slowing yourself down. The arms should be at a 90 degree angle while running. The should swing from the shoulder maintaining that angle. This will help drive and propel the body forward. Many athletes chop their arms which is wasted energy and not efficient. Use Resisted Sprints to Increase Speed - Resisted sprints provide huge returns in terms of speed development. They teach the body the feel of foward body lean and acceleration angles. I use resisted sprints with the Speed Tools Speed Resistor. We use these everyday at my Athletic Edge Sports Training Center. We perform 15 yard resisted sprints with the speed resistor with good form. Train the Core - When I tell athletes this they usually think of a ripped six pack. You need to train your core for movement and performance, meaning train the abs, obliques, hip flexors, back erectors, and glutes explosively for movement. So leave the crunches behind, and start training the core with med balls and dynamic movements such as overhead toss situps, russian twists, and rotational throws. These will develop power in your core and help you run faster. The summer is ticking away! What are you doing to make yourself better this summer? If you are looking for an edge on the competition check out Training for the NFL program, it gives you the specific training routines I use down here with my athletes preparing for NFL training camp. It even includes my position specific conditioning protocols.